Funko Star Wars Smuggler’s Bounty – Wookie! The April Funko Star Wars Smuggler’s Bounty theme is Wookie! Smuggler’s Bounty is a Bi-Monthly (every other month) subscription box distributed through Amazon.com, with exclusive items made by Funko, based on Star Wars characters and themes. Current box: Wookiee – If in doubt, let the Wookiee win. 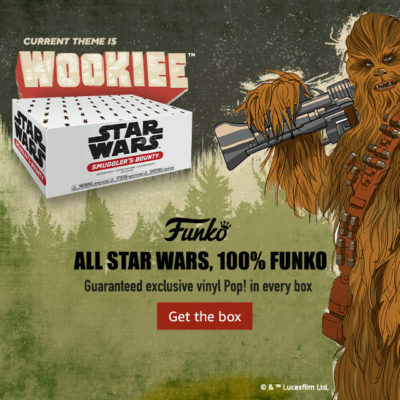 Everyone knows legendary wookiee warrior Chewbacca and that wookiees are adorable and make excellent companions to rogue spaceship captains but did you know they also make excellent themed subscription boxes? Celebrate Star Wars, wookiees and Chewbacca with a subscription box that will have you saying “RAWRGWAWGGR” with joy. There are usually four to six exclusive Star Wars + Funko items in each box and sometimes there will be Apparel, such as a *Tee or Cap. Every box will have at least one Exclusive Funko Pop! vinyl figure! Ships on 4/28/2019, so make sure to order before that date so you don’t miss out! *Confirmed Exclusive Tee in the Wookie box! Tagged Apparel, Collectible, Collector, Collector Alert, Figures, Funko, Smuggler’s Bounty, Star Wars, Toys. « Pop! Black Panther Erik Killmonger (Scars) Review!